Johnny’s son, Colton, or as he is affectionately known as “CJ”, has grown up in off-road racing in the shadows of his dad, knowing that someday he would follow in his footsteps. Like his dad, he began his racing career in motocross with regional victories and several trips to the National AMA Championship at Loretta Lynn’s in Tennessee. 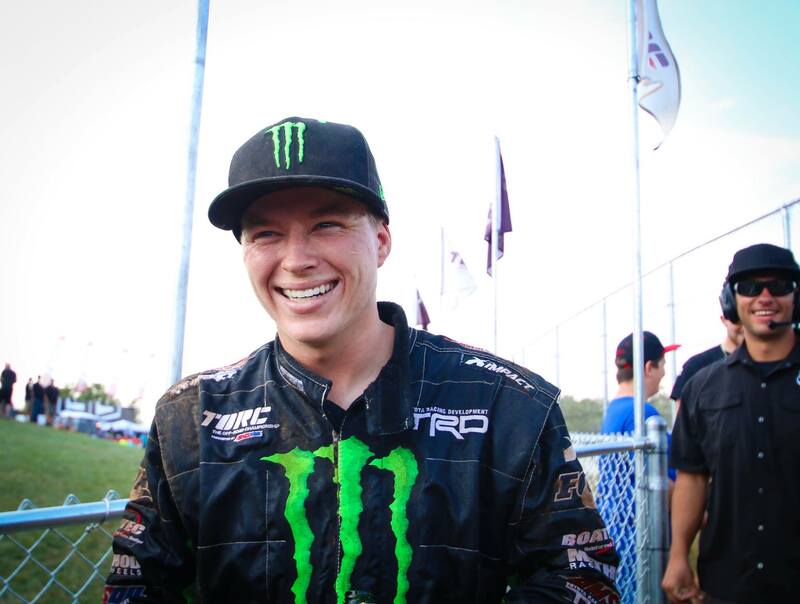 History Maker: Earned podiums in all 3 pro classes in one day (Crandon, Aug 31, 2014)! History Makers: First Father-Son division championships in the same year! In 2010, CJ got behind the wheel of a 4-wheel racing vehicle in the form of a Super Buggy at the tender age of 14. He immediately became competitive in a field of wily veterans. CJ got off to a great start by taking the second place podium spot in his very first race. He followed that up with 3 straight wins, 2-second place finishes and a third place. He finished the year with 5 wins and 9 podiums in 12 rounds of racing to claim his first off-road championship in the Super Buggy Class and become the youngest driver to win a short-course championship. CJ also took to the wheel of a Super Lite truck in the Lucas Series. These high performance arrive and drive trucks are a perfect training vehicle for the more powerful pro trucks. He currently sits in third in the Super Lite Truck points standings. In 2011, CJ went into the year to defend his 2010 Super Buggy Championship, and also to start his career in the Pro Light V8 class. He had an amazing year in Super Buggy with 7 wins, 4 second place finishes, and took the championship in the class for the second year in a row. CJ won the 2011 SuperBuggy Championship with an astounding 67 point lead. Stepping up to the Pro Light truck class proved to be a great learning experience for the young Greaves. With a brand new truck, the team had some developmental and growing issues on the way. A couple design issues had to be corrected, not to mention the addition of a 4th vehicle to the team, made for a big adjustment. By mid-season, CJ and the team were becoming comfortable, and it showed as CJ started to see himself as a top qualifier at many of the events. He ended the season with 5 podiums, 3 MAX Lap awards, and capped the year off by winning the Traxxas Pro Light Cup Challenge race. In 2012, CJ retired from the SuperBuggy division and took the bold step up to the full size Toyota Tundra Pro 2WD class while at the same time competing in the Pro Light division. With a new truck built and designed especially for his and his driving style, CJ promptly made off-road racing history by becoming the youngest driver to win a Pro-2 class race–in his first race of the year and only his second time in the seat. CJ competed hard and ran up front much of the 2012 season. He landed his second win at Bark River Michigan and shared the podium with his dad, Johnny Greaves in a classic special moment for the father/son duo. CJ’s ended his remarkable Pro-2 debut season 4th in the points standings. His run included 5 podiums made up of 2 wins and 3 third place finishes. He had 11 top 5 finishes in a field of incredible drivers and veterans. In the Pro Light class, CJ turned in another stellar performance with a 3rd place finish in the season standings. He only had 1 win but a truckload of 2nd places finishes (5 to be exact). He stood on the podium 8 times and received 4 Traxxas Max Lap awards for turning the fastest lap. 2013: CJ took the valuable experience he gained from his first year in the Pro-2 class un-intimidated by the field of veterans. He started the year off right by putting his name on the very first Combine Cup race which was part of a practice and testing weekend. CJ pulled double duty by racing in the Pro-2 and Pro Light classes. CJ came out of the shoot bucking in Dodge City, by going for the cycle with 1st and 2nd place finishes in Pro Light and a 3rd place finish in Pro-2. CJ took his first Pro-2 win of the season with a dominating victory on the mud soaked track in Eldora. Together, CJ and Johnny racked up 6 podiums in Bark River. CJ’s break-out weekend landed him a 1st and 2nd place in Pro-2 and back-to-back wins in Pro Light. CJ carried that momentum into Crandon where he podiumed in 3 our of 4 races. He also took a third place in the Forest County Potawatomi Community Cup race, narrowly missing a father/sun sweep, with Johnny taking the win. CJ took 5 more podiums in Pro-2 including back-to-back wins in the season finale in Primm and a spectacular photo finish win over none other than is own dad in the AMSOIL Cup race in Crandon to be the youngest driver to ever win that race. He had 5 more podiums in remaining 8 races in Pro Light to end the year second in the points standings including 8 Maxx Lap Awards. He ended his remarkable Pro-2 year third in points standings and had a total of 5 Oakley Bomb Awards for pulling the fastest laps. He had 10 podiums in Pro-2 made up of 4 wins, 2 runner-ups, and 1 third place finish. He also had 210 podiums in Pro Light made up of 6 wins, 3 second places, and 1 third place. 2014: 2014 was a breakout year for CJ Greaves as he claimed his first Pro-2 Championship. He did it in the form of 7 wins, 6 2nd place finishes. He ended his Pro Light run 3rd in the standings. CJ also ran in the Pro-4 class in the final 2 weekends of racing. In fact, CJ pulled off another historical accomplishment by earning podiums in all three pro classes in a single day. It happened on the final day of racing at Crandon International raceway. In only his 2nd Pro-4 race, he took a 3rd place. He followed that with a 2nd place Pro-2 finish and then, took a commanding victory in Pro Light class. 2015: CJ Greaves took on his first full season behind the wheel of a Pro-4 in 2015. He also sought to defend his 2014 Pro-2 championship. CJ’s season was nothing short of remarkable. He took his second Pro-2 championship and became the first TORC driver to win championships in both Pro-2 and Pro-4 in the same year. CJ landed 12 podiums out of 16 races in Pro-2. He held on to take the Pro-2 championship in dramatic fashion with a 3rd place finish in the final race. In Pro-4, he podiumed in all but 1 race including an incredible 8 wins and an exciting season finale AMSOIL Cup win to earn the triple-crown of TORC! 2016 was another incredible year for CJ. Having a full Pro4 season and a couple of Pro2 championships under his belt, he was not content to go through the motions. He continued pulling double-duty in the full-size truck classes of Pro2 and Pro4 and, added a Pro Stock UTV to his repertoire on the final weekend. After a sluggish start to his Pro4 season, CJ found his groove by late June and went on a tear–winning 6 out of the next 7 rounds. His championship bid came down to a showdown between the father/son duo on the final weekend of racing in Crandon. Johnny won the race but CJ came in a close 2nd, which gave him the necessary points to squeeze-out his dad by 4 points and claim back-to-back Pro4 titles. CJ turned in a dominating Pro2 season taking another championship in three-peat fashion. He was on the podium in every race including 8 wins, 4 2nd place finishes and 1 3rd. He put an exclamation point on the season by also winning the first ever Crandon World Cup race in both the Pro2 and Pro4 classes. He came in a close 2nd driving his Pro4 in the annual AMSOIL Cup race. If all that weren’t enough, CJ landed another racing opportunity in the form of Pro Stock UTV which he ran in the final weekend of racing in Crandon. He proceeded to win both races and plans to run a full UTV schedule in 2017. 2017: It’s a three-peat! CJ took yet another Pro4 Championship for the 3rd season in a row. He beat out his dad by 16 points as the 2 traded leads and tied throughout the season, ending up with a last race showdown in which CJ took the championship. He won 8 races and podiumed in all but 2 races. He came in a close 2nd to the elder Greaves in the FC Potawatomi race and landed a 3rd place in the Crandon World Cup Races. Jumping all-in to the UTV series, he put together an incredible Pro Stock UTV season, taking the Championship by winning all but the last race (12 of 13), which he came in 2nd. He also made appearances and podiumed in all 5 appearances.